I've forgotten where this info came from. Sorry! Edited by yours truly (contact me). The image came from Shaman King Pencil Boards. Shamans are those with the ability to see the dead and utilize their powers. They use spirits such as Samurai and Chinese Warlords. In Shaman King , it is the end of the 20th century. Yoh Asakura is a Shaman. He is on a training course, hoping to strengthen his abilities. 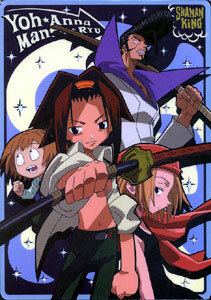 His ultimate goal: to participate in the Shaman King Tournament, an event which occurs once every 500 years. Shamans from all over the world compete in this massive tournament for one goal, to gain possession of the omnipotent spirit, The Great Spirit. Together with his classmate and best friend Mortimer Oyamada, his samurai spirit Amidamaru, fiancee Anna Kyoyama, and various other friends/rivals such as Len Tao from China and Trey Racer from the North, they will work towards the ultimate goal of becoming the all-powerful Shaman King. Trying to take a shortcut to school, junior high student Manta discovers Yoh Asakura, a Shaman, and his friends...the Wandering Spirits. Yoh, a Japanese Shaman from the mountains of Japan, has come to Tokyo for advanced training in the art of a Shaman. Since he was a young child, Yoh has wanted to become the legendary savior known as "The Shaman King". Yoh's partner ghost is Amidamaru, who in ancient Japanese legends was known as "The Fiend" for killing off 50 men in one violent attack. While others have come to Tokyo to accomplish the same objective as Yoh, Yoh must battle them off and save his friend to accomplish his ultimate goal. Yoh Asakura is a young shaman, one who can see, communicate, and unify with spirits. Yoh is training to become the Shaman King, strongest among all shamans, a title won by winning the Grand Tournament which takes place every five hundred years. With him are Morty [Manta], a short kid who can see ghosts, Amidamru, the ghost of a relentless samurai, and Anna, a spirit medium who is Yoh's trainer and fiance. Along the way, Yoh meets other wannabe shamans and their spirits. Yoh is a shaman in training under Anna, a "spirit medium". Yoh's main spirit is a 600 year old samurai who died on Monument Hill. His name is Amedamaru. Jun and Len are siblings, each with their own spirits, Lee Pai Long and Bason. Evey 500 years a tournament is held to crown the next Shaman King and this year Yoh is fighting to the top with his team. If he wins, he promised that Anna would have the postion of Shaman Queen. It's a epic struggle between good and evil! Who will be victorious? The above description came from Himura Kenshin, and was edited by yours truly (contact me).